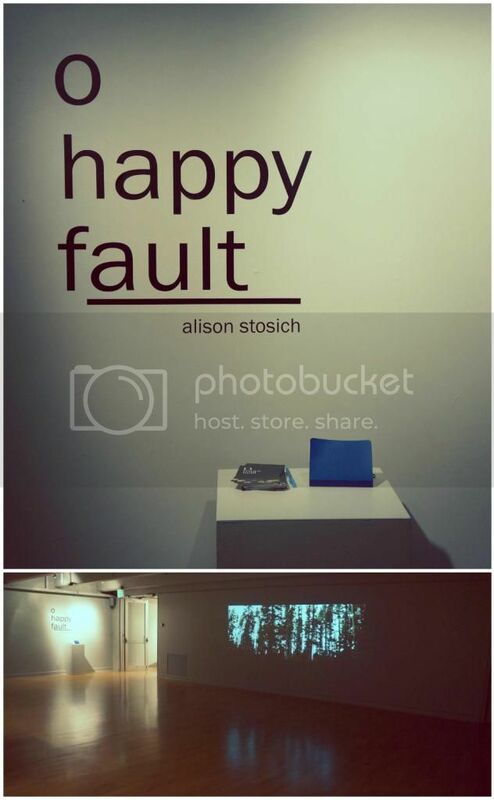 My dear friend Alison had her final show at BYU a little while ago. It was such a great turnout. I made some millionaire bars for her, and she had made ginger snaps. I don't know why, but I have never even thought to make those. They were delish. I took note to make those in the future. I loved her show, it was very contemporary, and if you are not into that kind of "stuff", well I probably would have just been content to keep you in that room for an hour. I was there helping so I was at her show for a while, and I am so glad I was there for so long. Her show made me think about my family and friends that I have to support me. I thought about memories and places that have brought me the most joy as well. She had a sound piece of her family eating dinner, and I just thought about all the loudness of my family when they are all together, and how much I miss living close to everyone. I loved the main piece. 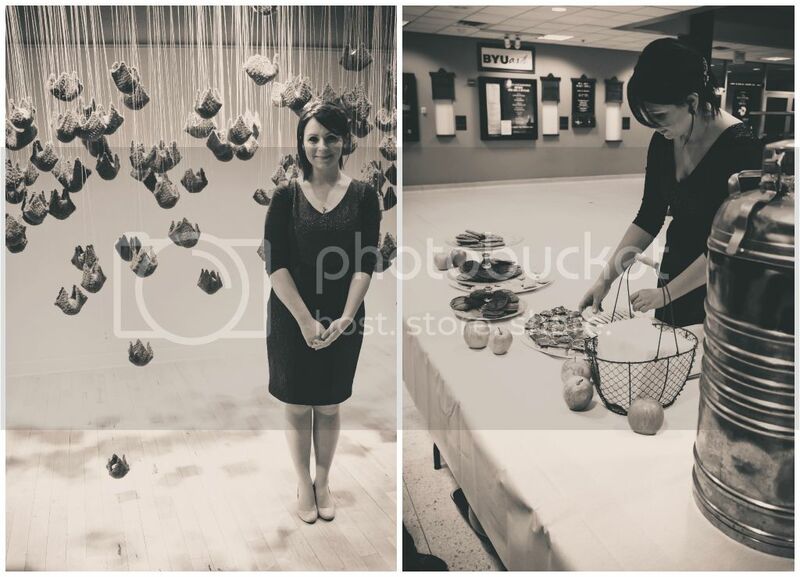 She had people knit or crochet these squares, and she hung them up with apples inside of them. Most of the apples she had casted herself, and they looked great. I loved the ideas of the show, and how I was also able to incorporate the gospel into it. I couldn't help but think of the happy "fault" of eve with the apple in the garden. This piece really made me think about that, and also areas of my life that I didn't perceive as a happy fall, but it really was. I thought about what it means for my fruit to be caught, or to have not fallen all the way. This piece can be very personal to anyone, because we have all had these kinds of experiences. 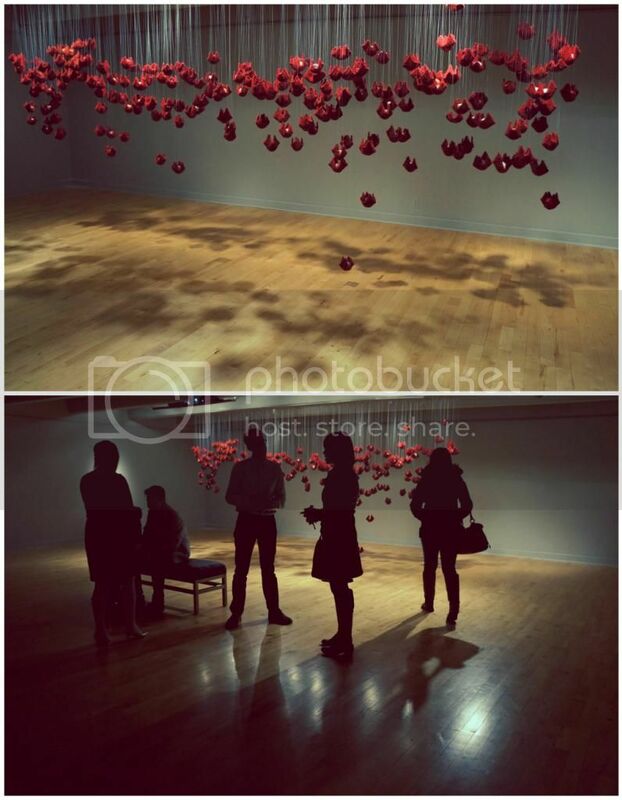 I also thought her video and sound piece captured what some might think an insignificant moment. Those moments, however, are terribly significant! Isn't that what life is about anyway, the little things? Those are the moments you look back on and remember. What an amazing show, that I think anyone could have gotten a lot from, if they wanted to of course. Just like all art.